Let’s begin with the principle of impartiality: the provision of aid solely on the basis of need. A chart (see below) plotting the organization’s 2019 budget shows that the Middle East is the overwhelming beneficiary of EU humanitarian aid – nearly 1 billion of just over 1.4 billion euros (174 million is earmarked for reserves and bureaucratic costs). The bulk of the funds go towards meeting the costs of assistance to Syrian refugees, followed by smaller sums to Iraq, Yemen, Palestine, and North Africa. 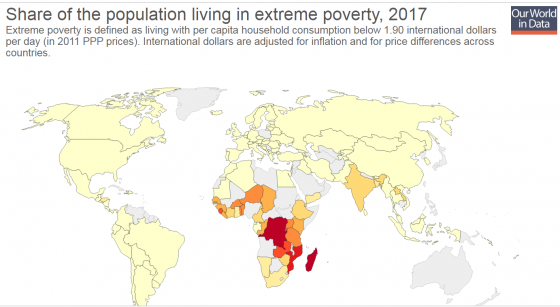 The problem with such allocations is that the overwhelming majority of people living in dire poverty reside in sub-Saharan Africa, India, and Bangladesh, according to a map (below) drawn up by a group of concerned economists based at Oxford University. These countries have the highest percentage of populations with a household consumption of less than $2 a day. Only one country in the Middle East fits this sorry bill: Yemen. According to the map and the principle of impartiality, the bulk of EU aid should be going to these countries, yet they receive only a small percentage. To get a clear picture of the reality of ECPHAO “impartiality,” one need only compare the amount Palestinians receive to the amount received by the poorest 20% of the world. According to the World Bank, 732 million people live in lower income countries. The 4.8 million Palestinians, by contrast, are classified as “lower middle class” – that is to say, in the quintile above them. Yet those 4.8 million Palestinians will receive 36 million euros, while 490 million will be disbursed for the benefit of 680 million people living in 32 other countries (not including Syria and Yemen, which are funded separately). The Palestinians, who are richer on average than those living in the poorest states of the world, will thus receive over six euros per capita, while the populations of the poorest states will receive around 0.70 euro per capita – less than one-eighth that amount. No one has explained why Ethiopia, which has a GDP per capita one-third that of Gaza and one-fifth that of the West Bank, should receive one-eighth the amount of aid Palestinians receive on a per capita basis. This is particularly remarkable as the ECPHAO has itself acknowledged Ethiopia’s greater plight – including a massive emergency refugee problem stemming from the 37-year-old Somali crisis. Discrimination in favor of the Palestinians even extends to Yemen, where a true humanitarian disaster exists. 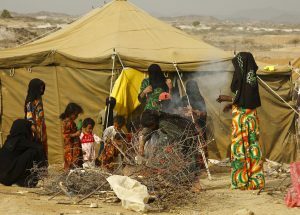 According to the EU, 79 million euros have been expended annually on average since the onset of the Yemeni crisis, compared to 36 million for the Palestinians. That is slightly more than double. Yet there are 4.8 million Palestinians, while the population of Yemen is estimated at over 28 million (of whom 22.5 million are in dire straits, according to the Commission). Yemenis thus receive less than half of what the already richer Palestinians receive. Even less defensible is the EU’s claim to political neutrality. Its favoritism towards the Palestinians on this score is visible as soon as one enters terms into the general search function on the Commission’s internet site. Enter “Palestine” and you get 20,737 results. Enter “Ethiopia” and you get almost the same figure, despite massive differences in a) population size (100 million versus fewer than 5 million), b) geographic expanse (Ethiopia is fifty times the size of “Palestine”), and c) degree of sheer suffering. The Syrian crisis, which is said to have led to the loss of half a million lives (though that figure is probably exaggerated), merits not many more site results than Palestine – just over 27,000. One of the foci of these reports is the plight of 35,000 Bedouin whom the EU assists, often in clear violation of the law, in Area C – the part of the West Bank under exclusive Israeli control. The hundreds of thousands of Bedouin in Sinai, however, the plight of whom is readily acknowledged even by Egyptian officials, gets no mention, even though Egypt is a recipient of EU aid. There are over thirty blog reports on Palestine compared to two for Egypt. The third criterion – independence of economic, military, and political considerations – is belied by the fact that Syrian refugees get at least ten times the aid Yemenis receive. Syrian refugees in Syria and surrounding areas will receive 860 billion euros in 2019. Yemen, which is burdened with no fewer internal refugees, will have to share a meagre 88 million with the Palestinians and Iraqis. Yet a reading of their relative plight, as described in the Commission’s fact sheets, suggests that at the very least, equal treatment is required to meet the challenges of the Yemeni tragedy. Unlike the Yemeni refugees, many Syrian refugees have found refuge in the relatively developed states of Turkey, Lebanon, and Jordan.